Almost anyone could give it some thought and come up a list of activities that are simple but bring some level of satisfaction. Art has always thought that doing familiar things with those you love is a good example. We like to watch Wheel of Fortune and Jeopardy and feel good if we can solve a few of the puzzles or answer some of the questions. Art also enjoys driving on a busy multi-lane highway – hitting a yellow light and then watching the traffic behind him have to stop. He says it warms his heart. Well he has just added another simple pleasure to his list. For the last 5 months with the dialysis catheter in his upper chest one of the big rules was to NEVER get it wet. Every time the nurses changed the dressing on it, they went to great lengths to sterilize the area. At least he could soak in the tub which wasn’t too bad. 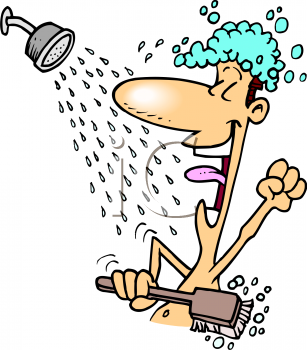 After the transplant he could not take a shower and could not soak in a tub. Morning cleaning rituals included a wash cloth, which was OK but not considered a pleasure. Now with the catheter removed and the incision healing nicely…this morning was his first shower in 5 months. Silly as it may sound…this is now his number one simple pleasure.